In many ways ISeeChange in 2018 was either a story of precipitation or lack thereof. Floods, hurricanes, droughts and wildfires impacted communities across the globe. In the U.S., ISeeChangers revealed a widening gap between east and west. In the winter, western states were warm and dry, while east of the Rockies, the winter was cold and wet. Both of these trends had far-reaching impacts on daily life that played out throughout the year. Worldwide, 2018 was another year of rising temperatures, increasingly deadly and expensive natural disasters, and for the second year — after a two-year break from 2014-2016 –global emissions rose again. Our community of users documented unusual precipitation patterns, extreme heat, and flooding from the U.S. to Kenya to India. We see and hear climate change impacts through your eyes. When you tell us that “you’ve never seen” something before, when you use the word “unprecedented,” or something just seems “weird” – we pay close attention. Last year was the fourth warmest year on record, while the past four years consecutively – 2015, 2016, 2017 and 2018, make up the top four warmest years ever. And 20 years out of the last 22, comprise the warmest in the history of record-keeping. The trend is evident: our world is changing rapidly. Since 2012 ISeeChangers have documented those changes in their backyards. As weather continues to become more extreme, we’ve seen the need for community adaptation solutions. As a result, ISeeChange expanded our work in flood-prone communities and in urban heat monitoring in 2018. 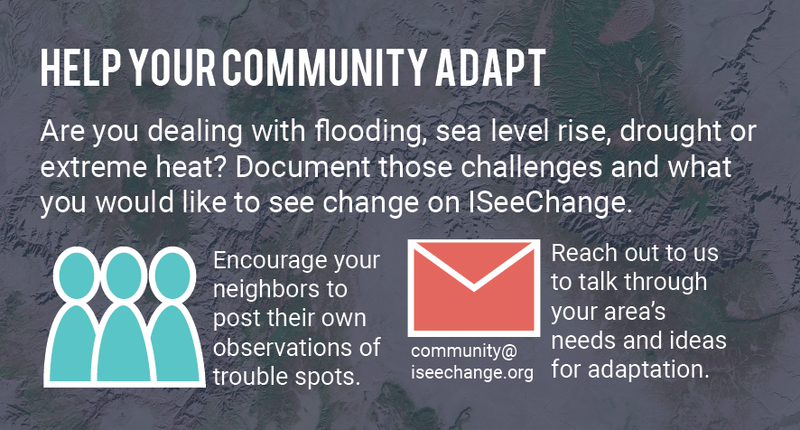 We added new features to allow ISeeChangers to collect data alongside their stories to inform resilience planning. This will continue throughout 2019 with sea level rise and drought, and if you want your community to get involved, please reach out. But first — here’s a rundown of what we saw through your eyes in 2018. As you read through the posts from last year, reflect with us. How does your today compare to last year? Have you been reporting the same phenomena and seeing patterns? Did we miss anything? You can post anything on ISeeChange.org from anytime, just change the date if you need to. Every post counts to tell the bigger picture stories from your back yard- season to season, year to year. From California, to Colorado, ISeeChangers reported warm temperatures and a snow shortage throughout the winter months last year. Will winter happen this year in Colorado? Looking at another week of 40 and 50 degree weather makes me afraid of water shortages this summer. Such a difference from two years ago! Here is a picture of 2016 Groundhog day and today. After rescheduling our January 6th trip to the AZ Nordic center in hope for snow on the ground in February, we were a little sad that after two weeks of sunny weather with highs in the mid 60’s F, most of the snow from the mid January snowstorm had already melted when we arrived on February 3rd. There was berry little snow left, even at the top of Mt. Humphrey’s. We didn’t stay sad for too long, however, because of the beautiful vistas and glorious daytime temperatures that made hiking quite pleasant. This exceedingly dry winter and the lack of precipitation that continued into the summer set the stage for dry rivers, stressed trees, thirsty pollinators, dry crops and pastures which caused economic woes for farmers and ranchers. Horse pasture grass is completely dead. We had to supply hay for our horses early. Hay prices were $2-3 more a bale. Irrigation ditches were empty much of the 2018 summer in Durango, Colorado. This example illustrates the dryness of climate. The total time for irrigation was 3 weeks. The drought also paved the way for devastating wildfires. What’s it like when a fire is #10milesfromhome? I live in the mountains. A mountain town. In a mountain town, there are plenty of places to look up and over, and see the fire. I’d never seen wildfire burn. 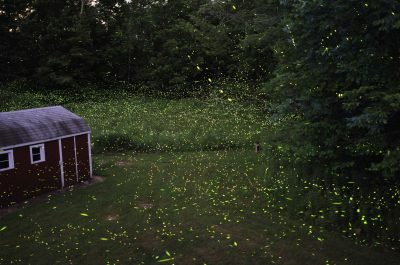 I sat one night on my neighbor’s lawn. They were away. The view up the valley from their home is of the whole valley. I watched the fire, the flames, and the smoke as the sunset. The mountains grew dark. The sky grew bright. Helicopters flew water to the fire, thundering as they went nearly overhead. We’ve begun to grow accustomed to their drumming and thumming. I tried to leave and head home. I tried to stop watching the fire that night. It was mesmerizing. Flames leapt up from the mountain side. I could see the silhouettes of trees. It was the day the fire grew from the back of Hermosa mountain around to the front side, to near many homes. Those wildfires created poor air quality that extended across the country and caused health concerns for nearby communities. “I stay inside with windows closed if the air is too smoky because it makes my eyes hurt and one incident was bad enough to make breathing difficult,” said Sue Stroud to the north in Brentwood Bay, British Columbia. Related ISeeChange stories: When the river runs dry, 416 Fire makes Coloradans wonder if wildfires have limits, How will plants and their pollinators face a warmer world, and Searching for the city trees of the future in Southern California. In Vermont, the frequent freezing and thawing led to damaged infrastructure according to this ISeeChanger, alongside reports of an “early pothole season” by transportation authorities The warmups also confused plants and wildlife. In upstate New York, one observer noted robins returning early while in Wisconsin, sandhill cranes did the same, as did hummingbirds in North Carolina. There are a few signs of early spring around the yard- for example, daffodils and day lilies popping through the soil surface. It’s been warm enough the past couple of days to go outside wearing a sweatshirt, but a nor’easter tomorrow is expected to bring snow. Birds and plants were made extra confused by an onslaught of spring snowstorms amidst the warming. In the Northeast, a series of record-breaking March nor’easters brought heavy winds and wet snow that damaged trees and power lines, caused coastal flooding, black ice, and cancelled schools. Three nor’easters in a week? That’s weird! In the Midwest, migratory birds returning too early were left out in the cold. Late-spring winter weather has been hard on the migratory birds in our area. Conservation groups have reported that the number of calls about sick and dying birds is way above normal. As the snow melted, rivers and streams filled and flooded giving a damp start to what would turn out to be an unusually wet year. Yesterday’s 2.5″ of rain resulted in some minor flooding along the Shetucket River near Willimantic. The automated gauge reached just over 9 feet, well below flood level. Still, the river usually just putters along at a few feet so that fisherman can stand in the middle in their waders with no problem. We’ve had close to 4″ of precipitation locally, about normal for the whole month of April. Related ISeeChange stories: How a warming Arctic may be driving snowstorms and cold on the East Coast and Is climate change to blame for a whack spring? Snowmelt from those spring storms combined with spring rain led to flash flooding in parts of the East Coast and the South in April. 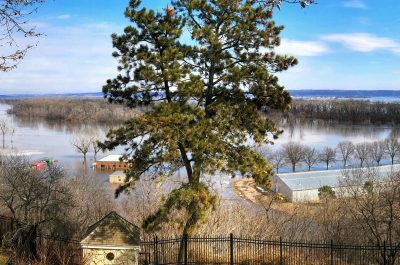 Meanwhile risk of river flooding rose in those areas as well as the Midwest. After a beautiful weekend we had a Flash Flood warning! What a vast change from the 75 degree weather of the weekend. The flood will not be good for new yorks water ways given it makes it very easy for the water to get sewage in it. This flood could effect a lot of people and wild life and new york has not gotten this much rain this year. While New England and the Midwest dried out a little in May and June, the Southeast got soggy and a major rainstorm hit ISeeChangers in New Orleans on May 18 covering streets in water and blowing festival tents around. It was raining and the power line exploded and it was like a bomb. And there were sparks. There was a fire truck—2000 people lost power for a couple hours. New Orleans then passed much of the summer without a major rain event— which was very different than 2017. To the north, the Mid-Atlantic, Northeast and Midwest were waterlogged again by July and lakes and rivers that been high in the spring swelled to their banks again in August. Water levels changing in the Susquehanna River, Chenango County NY due to recent rains in Afton. Water is still higher than usual. Because of all the rain the last few days ground is too saturated and there are lots of areas with standing water. More flooding at Hunter’s Field playground. The conditions are exacerbated by runoff from I-10. Rain wasn’t the only thing that caused flooding. In early 2018 researchers reported that melting ice sheets have been responsible for seven centimeters of sea level rise since 1993. They projected that rate could triple by 2100. Coastal communities are already feeling the impact of rising seas. In October and November, new ISeeChange observers from coastal communities in the east like Hampton, New Hampshire, Virginia Beach, Virginia, and Ocean City, New Jersey reported tidal flooding events. Flooding at 30th and Haven Ave. High tide pic taken st 10:40 am. Unfortunately typical, about 8” of standing water which is not as bad as usual. Commercial truck driving through causing more damage. Unfinished pump station in the background. Related ISeeChange stories: Summer storms reveal that New Orleans has more than just a pump problem and The race to slow stormwater and predict future rain. ISeeChangers also reported another impact of rising seas, coastal erosion. The ocean warmed to record-breaking levels again in 2018 and scientists reported that the seas have been warming even faster than predicted by the UN in 2013. These warm waters fueled destructive hurricanes that impacted ISeeChangers on both the Pacific and Atlantic Oceans. Enjoying the power we still have! Hurricane Florencea Outer Bands of wind amd rain are coming into us tonight. They are expected to increase early in the morning. Some rain tonight with no flash flooding or issues. Reports of a tornado in Wilson NC. There was a radar indicated rotation for my town earlier. More coastal counties are being swamped by storm surge with high tide coming again. Florence has slowed to 5 MPH. So she is taking her time. Warming waters also impacted ISeeChangers in Sarasota, Florida who dealt with a months-long algae bloom called Red Tide that killed marine life, caused respiratory illness and damaged the town’s tourism with the stench of fish rotting on the beaches. Heavy rains from Hurricane Irma in 2017 and from spring rainstorms in Florida contributed to the bloom by producing nutrient-rich runoff. ISeeChangers in a variety of locations also noted two potential emerging trends: more algae blooms on lakes, and plants blooming in the fall when they typically bloom in the spring. ISeeChangers reported algae blooms on lakes in California, Ontario and Wisconsin in 2018. Even on Lake Superior, a traditionally cold and low-nutrient lake, there was an unprecedented algae bloom this summer. 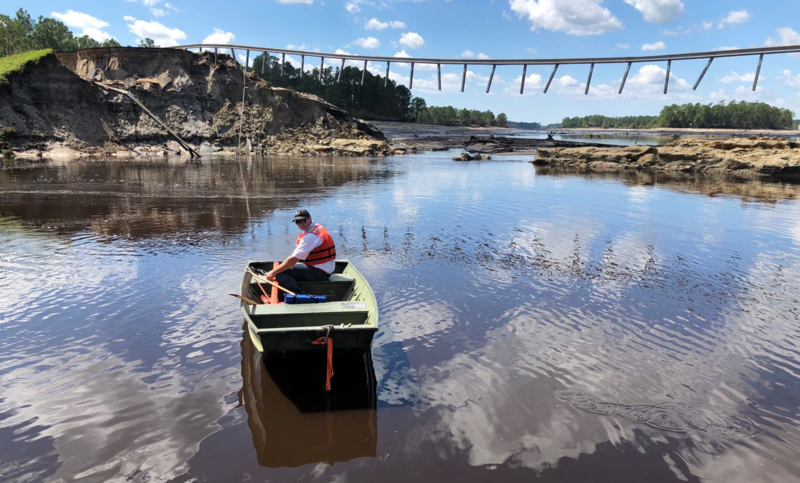 Algae thrives in warm, nutrient-rich water so the combination of rising global temperatures with increasingly intense storms that cause runoff may make algae thrive. If you see any in your area in 2019, be sure to share it in an observation. We’ll be reporting more on this soon. 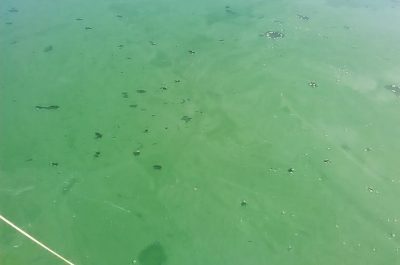 Even though It’s already late September, the lingering hot weather recently has made the algae blooms last longer than they usually do during the summer. This, paired with really low water levels is causing a lot of rotting algae buildup along the waterfront where there used to be sandy beaches; also causing a lasting horrible stench. Fall blooming was another weird trend that we saw documented by several ISeeChange observers in the Northeast. In Rhode Island, one observer found their lilac — a spring bloomer — blooming in early-October. In New Jersey, this rhododendron — another spring bloomer — bloomed in mid-November. While apples — yet another spring bloomer — bloomed in upstate New York in October. Apple trees are blossoming again! After losing all thier leaves last month, and then some growing back, there are new blossoms, in October. If you saw anything like this in 2018, you can back-post at any time, and be sure to keep an eye out for plants that seem to be blooming at off-times in 2019- especially in the winter! Beyond North America, 2018 saw plenty of weird weather and climate trends across the globe. 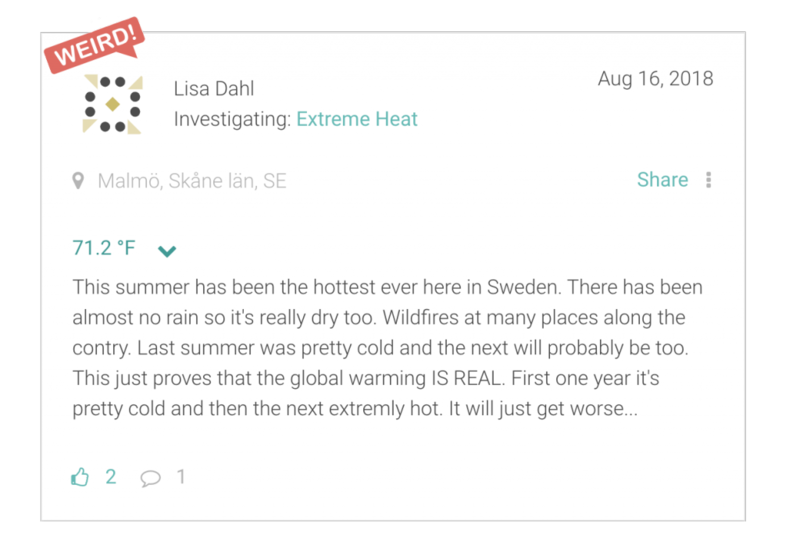 ISeeChange is lucky to have a small-but-growing community of international users who give us a peek into what climate change is like around the world. We are always looking to increase global perspectives on ISeeChange, so tell your international friends to sign up and share! In parts of South and Central America, punishing droughts that spurred migration and devastated crops leaving many hungry. In Brazil, one ISeeChange observer noted that storms seemed to be getting stronger and windier. I see the effects of climate change. I see very powerful winds and storm full of anger due to unrational activities of human. What would be natural and with no disasters is getting out of control and provoking several damages to communities and cities. Moving west, observers in the UK and Russia reported colder-than-normal spring temperatures. Europe followed that cool spring up with a blazing-hot summer full of wildfire. In the fall, as in the U.S., countries in central Europe and the north Mediterranean received powerful rainstorms that led to flooding. In December, an Italian ISeeChanger noted that plants that should have gone dormant were still green. Even though we are well into winter at the moment, many non evergreen trees, and almost all small plants in the area, remain completely green. Long time ISeeChanger Kamweti Mutu has been documenting changing precipitation patterns in his neighborhood outside Nairobi, Kenya for several years. After a relatively-dry 2017, Mutu noticed that 2018 started out wetter than usual. The last two storms have dumped over 2 inches of rain in the past 2 weeks. January is normally hot and dry. This is unusual! By May, Kenya was dealing with deadly floods that displaced people and devastated crop and livestock farmers. Precipitation patterns in Mutu’s area continued to be strange with steady rain in the early-fall dry season. The typical “short rains season” in November saw lower-than-normal rainfall but then picked up late, dumping rain in December. Well the rains showed up in abundance, although late in the season. And by some accounts, we have hit our short rainy season quota, which is good news for farmers in particular. West of Mutu, in Cameroon, an ISeeChange observer reported unpredictable precipitation and insects on maize crops that he worried would hurt crop yields. Rainfall weirdness ultimately didn’t leave a major mark on crop production in Cameroon, though civil unrest did. Meanwhile, one pest native to the Americas, the fall armyworm, is a growing problem in Cameroon. In the past two years the fall armyworm has infected “80,000 hectares of farmland in Cameroon, slashing harvests of the country’s staple cereal crops by as much as three-quarters in some regions,” according to a Reuters report. The climate in Buea or South West Region has no regular pattern. Famers can plant maize till now and yes they grow well but then will they be able to harvest as insects have began eaten the leaves of maize plant. ISeeChangers in India reported warmer-than-usual temperatures from January to May. In Pakistan, a heat wave during Ramadan in May killed up to 100 people. One observer in northern India, in the city of Kharakhet, noticed that rainstorms that she’d usually expect to see in March started in February instead. There was a sudden increase in the wind speed and then a low pressure region was created. Soon there was a heavy rain. Spring is due to come on March 15 but its still February 24. Climate was like this the whole day. In May, neighboring state Uttar Pradesh was hit with a dust storm that killed over 100 people. Then, the southern state of Kerala experienced deadly, record-breaking flooding in June. This is unusual, most probably due to climate change. The rain poured down causing flood and also death of few people! This happened in kerala state of India. ISeeChangers in India also grappled with poor air quality and pollution throughout the year. “There has also been increasing concern among the citizens about the government prioritizing development over the environment,” said observer Abhramika Choudhuri in Pune, a city about two hours from Mumbai. Throughout 2019 we will continue to study your posts to identify what climate issues and impacts people across the world are dealing with. Often ISeeChangers are noticing important trends long before scientists, governments, and mainstream media.The ISeeChange team is busy developing new features for our community to see those changes and track them. And our community is already documenting winter weirdness to watch. It’s January in Colorado and it’s raining. The storm clouds moved in and the temperature went up. This is frustrating for many skiers since rain makes the snow heavy and icy, or melts it all together. Last night did not get below freezing. I feel like this is more of a spring weather pattern, and not something we see in the dead of winter. Keep us posted on what’s happening in your backyard and how it’s impacting you! Every sighting counts. Cover art by the U.S. Army Corps of Engineers.